Beyond Extreme Energy | No new permits for fossil fuel infrastructure. Renewable energy NOW. Live from FERC’s Awning it’s…BXE! This morning two activists from Beyond Extreme Energy scaled the entryway of the Federal Energy Regulatory Commission office in Washington D.C. The pair now sit atop FERC’s awning over 25 ft above the ground, holding a banner that reads ‘Federal Energy Regulatory Commission NO! Federal Renewable Energy Commission Yes!’ Meanwhile, somewhere in the FERC office commissioners are preparing to meet on the approval of fossil fuel projects that will negatively impact our world for generations to come. You can check out photos and live streams of the action on our Facebook and FRECnotFERC.com. The action was taken by ​Beyond Extreme Energy​ on behalf of millions of affected citizens who are frustrated by years of FERC’s approvals of pipelines and other fossil fuel infrastructure, and alarmed by Donald Trump’s recent Executive Orders to further expedite pipeline approval. This action launches our new BXE campaign aimed at turning the Federal Energy Regulatory Commission (FERC) into the Federal Renewable Energy Commission (FREC). FERC is beyond reform and must be replaced with a government agency capable of meeting the challenge of climate change head on. Fracking contaminates water, poisons the air and land, leads to earthquakes and to methane leaks that​ ​​accelerate dangerous global heating. With scientists warning that we have less than 12 years to radically re-make our economy to avoid the worst impacts of climate chaos, activists are demanding that Congress replace FERC with FREC, the Federal Renewable Energy Commission. Congress has the power to remake FERC into FREC as part of a Green New Deal. The FREC agency would be an important part of plans to regulate our nation’s electrical grid, prioritize the growth of renewable energy, and reject all gas industry expansion and other fossil fuel projects. BXE is a grassroots direct action group focused on FERC issues and frontlines logistical support. We are made up of activists each fighting frontline battles in our own local communities, but we come together to take on FERC because of its central role in the fight against fossil fuel expansion. We rely on y’alls support to carry on this fight. Please donate and get involved if you want to see more actions from BXE! We’ll see y’all in the streets, in the forests, and on the awnings. “Bernard McNamee is a fossil fuel extremist who should never become a FERC commissioner,” said Ted Glick, who was arrested in November 2018 for disrupting the Senate committee vote on the nominee. McNamee was eventually approved along party lines by only one vote, 50-49, a big change from the usual voice votes. A recent Huffington Post article mentioned the Democrats’ lackluster response to goings-on at several federal agencies, but didn’t mention FERC, the Federal Energy Regulatory Commission. Those of us fighting FERC like to say it’s the most dangerous federal agency most people have never heard of, and this Huff Post article didn’t mention it. But FERC is becoming better known, and one of the reasons is that Dems have stepped up to fight for their nominees, and especially to fight against Republican candidates deemed unqualified, thanks in large part to grassroots pushback. FERC approves virtually all fracked-gas interstate pipelines and related infrastructure project applications that come before it, including compressor stations and LNG export terminals, so it has huge influence over our economy — and our carbon footprint. The Intergovernmental Panel on Climate Change makes clear that we have just a dozen years to stop emitting global warming gases if we hope to stop climate catastrophe — and methane (fracked gas) is a global warming gas that is 100 times worse for the climate than CO2 in the near term. No more than three of the five commissioners can be from any one party, and due to a confluence of events five months after Trump took office, only one person – a Democrat – was a functioning FERC commissioner at the time, so Trump was able to nominate four new commissioners in 2017. Another Democrat and three Republicans were confirmed by the Senate – all by voice vote. The attitude seemed to be, ho-hum, nothing to get excited about here. Then in 2018, one of those Republicans left after just a year in office, and another – the FERC chairman – died in office. So Trump got to nominate two more Republicans. So far he’s nominated just one, Bernard McNamee, and instead of approving him by voice vote, Senators battled over the nomination. Dems insisted he was unqualified because when he was at the Department of Energy in 2017 he had tried, on behalf of Trump, to convince the FERC commissioners to bail out nuclear and coal plants that are having a hard time surviving on an even playing field with other sources of energy, which is supposed to be a fundamental tenet of the agency. Members of Beyond Extreme Energy and a number of other groups waged a campaign in the fall of 2018 against McNamee. In the end, he was approved along party lines by one vote, 50-49, and Democratic senators and members of watchdog groups are insisting that he must recuse himself from any issues that relate to the original position he pushed. Now, the long-serving Democrat, Commissioner Cheryl LaFleur, is stepping down this summer at the end of her second term, so Trump will get to nominate her replacement along with the third Republican. It will be interesting to see whom he picks, and how much support or opposition the two nominees will generate. December 20, 2018 | Washington DC — This morning, members of Beyond Extreme Energy and friends were at FERC (Federal Energy Regulatory Commission) to “welcome” new commissioner Bernard McNamee to his first meeting. After a campaign against his Senate confirmation because of his close ties to – and adulation of – the fossil fuel industry, and his denigration of both clean energy and those advocating for it, he squeaked by in a 50-49 Senate vote along party lines – by far the most controversial nominee ever seated. Maybe he’s listening. BXE veteran Ellen Barfield noted, “McNamee said at least for today and a little while in the future he’s going to just listen and vote present.” Activists are also urging anyone who doesn’t think such an extreme partisan in favor of expanded burning of planet- and community-destroying fossil fuels should be sitting as a FERC commissioner to call his office to express their opinion. You can help! Call McNamee’s office at 202-502-8510 and tell him to recuse himself or resign. And click here to chip in to support BXE’s efforts to bring accountability to FERC in 2019! Beyond Extreme Energy Disrupts McNamee Hearing! Early this morning we disrupted the Senate Energy and Natural Resources Committee hearing for FERC nominee Bernard McNamee. McNamee is a long time energy industry insider and climate denier. He has worked as a lawyer for energy companies, the energy spokesperson for the conservative think tank the Texas Public Policy Foundation (funded by Exxon-Mobil and Chevron), and the energy advisor for Ted Cruz. Last summer he was instrumental in drafting policy with Rick Perry to subsidize the ailing nuclear and coal industries, a move that even FERC unanimously rejected 5-0. By putting McNamee directly in FERC- Trump seeks to politicize the Federal Energy Regulatory Commission instead of maintaining its place as an independent government agency. Two additional BXE members stood and held a banner reading “Vote No On McNamee!” All three were taken out of the hearing and arrested. As of this time, all members are out of jail but the fight against McNamee is not over! The Energy and Natural Resources Committee will be meeting to vote soon after Thanksgiving. Senator Murkowski (AK) has stated that the decision will go before the full Senate in December. We must stop McNamee from joining FERC! Right now FERC has four commissioners, two Democrats and two Republicans. In the past that didn’t make any difference; all commissioners voted to rubber-stamp proposed new gas pipelines and infrastructure. But for the last year things have changed. The two Democrats, Richard Glick in particular, have often voted against these proposals. We’d like to keep things as they are until Congress investigates FERC’s abuses of people’s rights, the environment and the law and takes action to change that reality. You can join the campaign against McNamee by calling your Senators and telling them to “Vote No On McNamee!. We’re already gearing up for our next action in DC- if you are interested in taking part please fill out this form and we’ll keep you in the loop! Call the Senate Energy and Natural Resources Committee! On November 15 in the US Senate, coal-loving, climate denier Bernard McNamee will appear for a hearing before the Senate Energy and Natural Resources Committee. If Donald Trump gets his way, this will be the first step on a path to his soon becoming a commissioner at FERC, the Federal Energy Regulatory Commission. Beyond Extreme Energy and allies will also be at the hearing, and we urge you to consider joining us. Lets cause a ruckus and STOP McNamee! The Senators and the press who will be there need to see that there are a lot of us who want McNamee to be voted down! McNamee has been a longtime promoter of fossil fuels. In an op-ed for The Hill newspaper, he wrote that fossil fuels had “dramatically improved the human condition” – on Earth Day 2018 no less! And as the head of the Department of Energy’s Office of Policy, he worked on and then defended in a Senate hearing Rick Perry’s proposal for FERC to bail out the coal and nuclear industries at the expense of renewables. This plan was so obviously biased that even FERC voted 5-0 to deny it. At three Senate hearings last year on FERC nominations, BXE members took action. Some led to people being arrested, and others did not. That is the general plan for this action. The key thing is that we have a good turnout! Please sign up here https://bit.ly/2OfUHtf if you want to come or are seriously considering coming on November 15. We’re lining up food and housing for the evening before at a church close to Capitol Hill. And we can help if there’s a need for gas or bus money to get there. We hope to hear from many of you soon! Sign the petition against McNamee here! P.S. If you haven’t seen the video of our effective “Super Villains for McNamee” action in the Senate on October 16th, go to https://beyondextremeenergy.org. It was a creative, effective action. What a week, what an action! Donald Trump has nominated the coal-loving, climate-denying Bernard McNamee to be a Commissioner at FERC, the Federal Energy Regulatory Commission. And the Senate is moving at “warp speed” to confirm him! If they do, McNamee will help Trump build a fossil fuel empire that will last a generation by approving dozens of new pipelines and gas export facilities, and rigging electricity markets so we all have to pay more money for dirtier power. It’s a plan so dastardly and dangerous, only a super villain could have come up with it! This action was only the start of our campaign to stop McNamee and shut down Trump’s FERC. On Monday, just before our villainous lobby day, we launched a new petition with partners at Climate Hawks Vote and other groups to oppose McNamee. If you can’t donate (or if you already have) please sign on here to stop McNamee – and we’ll deliver all the signatures at or before his hearing on November 15. But we only have a few weeks to organize, and with a big election coming up, we’re know many of you will be busy doing good work in that arena. We need your support to keep our two organizers on the road and meeting with more local communities. We need to re-vamp our website and facebook page to spread the word. And we need your support so we can go BACK to DC in less than a month and confront McNamee in person at his hearing. We have very little time, and a lot to do. If you can, please consider chipping in to support us, and tell your friends to sign on to our petition. PS – Need a reminder about who McNamee is and why we oppose him? Check out this short email from last week, or check out my Loooooong blog post with tons of links and footnotes. If you want to write your own email, blog post or update about McNamee, we’ve made it easy by creating a toolkit with sample materials to share and promote the campaign. The time to escalate is now! Click here to sign up! BXE is planning a three-day sharing/training, art-build and action from June 23 – 25, beginning the morning of Saturday, June 23. Will you join us? Our communities and our planet are in desperate need of a halt to the permitting and building of all new fossil fuel pipelines and other infrastructure. Communities in the way of proposed new pipelines, compressor stations, storage and export facilities face toxic industrialization, eminent domain abuse, air, land and water pollution, and threats to health and safety. And our disrupted climate can only heal when jobs-creating renewable energy and energy efficiency have displaced fossil fuels, and people power has displaced corporate power. For decades FERC, the Federal Energy Regulatory Commission, has supported the oil, gas, coal and nuclear industries. It has rubber-stamped virtually all gas pipeline permit applications. It has confronted us and the rest of the country with a rigid, unified and punitive refusal to listen to grassroots concerns about communicide and climate change. This has led to a massive build-out of fracked gas infrastructure in many parts of the country, with all of the disruption and danger that come with it. Industry leaders are openly upset about the grassroots actions that have affected their plans. State and federal courts are beginning to delay or challenge FERC permits, efforts to subvert state powers over air and water quality, eminent domain abuse and actual pipeline construction. Fracked-gas prices are so low that some companies have gone bankrupt, while costs are increasing. Trump’s steel tariffs are hurting the pipeline industry. A broad range of groups are working together to get banks to stop financing extreme energy. Wind, solar and renewable storage technologies continue to grow, as low prices make them much more attractive, and this is happening worldwide. 2017 was the first year ever that both coal and gas declined in the electric power sector. Several states have stopped the construction of new gas-fired power plants, and resistance against them nationally is a big worry to the gas industry. There are even cracks appearing at FERC: Commissioners voted unanimously to reject Rick Perry’s push to further subsidize coal and nukes. They voted, because of a court decision, to end a substantial tax break for pipeline companies. The new Democratic commissioner, Richard Glick, issued several strong dissents on pipeline permit applications; and there have been other dissents too. These can greatly help court challenges. It is time to escalate at FERC. BXE is planning three days of sharing/training, art-building and action from June 23 – 25, beginning the morning of Saturday, June 23. On June 23, we will take part in the DC national action being organized by the Poor People’s Campaign. This will be the last of 40 days of action the PPC is organizing around the country. Following the demonstration we will gather in the late afternoon for a time of sharing, art-building and getting prepared for action at FERC and elsewhere the morning of Monday, June 25. We will spend all-day Sunday continuing that preparation and community-building. We intend to devise actions that can further open up the cracks in FERC’s leadership and structure. In the past, BXE has had success in getting the attention of FERC employees, the media and others with nonviolent blockades, fasting, die-ins, days of silence, sidewalk feasts of pancakes and sweet potatoes, music, prayer and bird-dogging. We are also considering other locations where we could take action. We urge you to sign up (click here!) for this convergence and action. It’s time to Crack FERC Open! Food: Seeds of Peace will be cooking for us. There will be three meals a day. Housing: Those who need housing are welcome to stay with us at St. Stephen’s Church (1525 Newton Street, Washington, DC). The church will be available from 4 p.m. on Saturday, June 23 to the morning of Tuesday, June 26. We will be sleeping on the floor, so please bring any and all bedding you will need to feel comfortable. Bathrooms and a showers ($1 per use for the shower) will be available. During the day, we will lock our items in a storage room at the church. Schedule: We will gather for the Poor People’s Campaign event on the 23rd beginning at 9 am, on the mall at 10th and Jefferson St. SW, in front of the Smithsonian Castle, where we will have colorful, attractive t-shirts for people to wear, literature to pass out about June 25 and 26, and a 50-foot long mock pipeline. After the PPC rally and march to the Capitol, which begins at 10 am on the mall between 7th and 9th Sts and is expected to end by 2:30, we will head up to St. Stephen’s Church, 1525 Newton St. NW, for our art-build at 3:00 PM. We’ll spend that afternoon and evening time working with Kim Fraczak of the Sane Energy Project, who will be bottom-lining the art build and prop- and sign-making for BXE’s actions on June 25th and 26th. We’ll also have our first meal together, provided by Seeds of Peace. Those who want to can stay overnight at St. Stephen’s: We’ll be sleeping on the floor, but people can use pew cushions, if you don’t bring a mat, along with your sleeping gear. There are bathrooms and a shower available for our use. Sunday morning we’ll leave pretty early, storing our personal gear in a locked room. Seeds of Peace will provide breakfast. By 9 am we’ll gather at a nearby site for a day-long gathering. We’ll be there until 5 pm, getting to know each other, getting organized, building community, learning about one another’s pipeline fights, doing a nonviolent direct action training, hearing a legal update from our lawyer Mark Goldstone, etc. At 5 we’ll return to St. Stephen’s to finish our preparation for Monday’s big day of action. Seeds of Peace will provide lunch and dinner. People who want to will stay overnight Sunday night at St. Stephen’s: We’ll get up early Monday morning and leave for FERC for our activities there, as well as possibly other activities throughout the day (still in the consideration stage). One certainty is we’ll be taking action at the DC Convention Center where the World Gas Association just happens to be gathering for the first day of a four day conference. We’re also considering doing some bird-dogging of appropriate power structure players. IMPORTANT NOTE: We will have a mix of activities. Some will involve a risk of arrest, and some will not. We need people willing to take part in each kind of activity to be successful. Seeds of Peace will be providing food for us throughout the day Monday. We will be staying overnight Monday night at St. Stephen’s. We’ll leave early so that we can we can get to Samuel Gompers Park, between 10th and 11th St. at Massachusetts and L St. NW, where we’ll gather at 8:30 am to get organized to go to the World Gas Conference where Department of Energy Secretary Rick Perry is giving a keynote speech at 9 am. FERC’s review of its pipeline review process: ​Previous emails from us had reported that June 25 was the last day of a 60-day time period for comments to FERC about its (rubber-stamp) process of reviewing (approving) proposed gas pipelines and infrastructure. Because of pressure from organizations fighting pipelines, FERC has extended the period for comments until July 25. We’ll be delivering, in person, our message about what needs to change at FERC. Luci Murphy to lead us in song: We’re pleased to report that Luci Murphy, long-time cultural warrior and activist, will be with us the afternoon of June 24 and 25 to contribute her beautiful and soulful voice in song to our efforts. Nonviolence principles: We will be guided by these BXE nonviolence principles (click here to read them). Poor People’s Campaign: The PPC is organized in more than 35 states, and it has held actions in those states three Mondays and the Tuesday after Memorial Day since they kicked off the 40 days of action campaign on May 14, the day after Mother’s Day. The final day of action will be June 23 in DC. BXE is pleased to be part of this important, historic movement, and we urge everyone to take part as much as you can in the weekly actions. You can find out more about the PPC here and you can read an article I wrote about it here. Donations: We are asking that all taking part in the June 23-25/26 actions, especially those sleeping in St. Stephen’s Church and/or eating Seeds of Peace-provided food, donate to help cover costs. We are asking for a $35/day donation, but we welcome everyone, whether you can contribute $5/day or $100/day. No one will be turned away because of their financial status. Click here to make a much appreciated (and needed) donation. Beyond Extreme Energy has decided to pull together and publish regularly a calendar of actions being planned, in the works or on-going. We will publish it at least every two weeks. It will be available on our website, and it will also be distributed via email and social media. It is a calendar primarily for actions aimed at stopping the building of any new fossil fuel infrastructure. Submissions for this listing should be sent to actions@beyondextremeenergy.org and should include location, date(s), description (short) and contact info. The Action Calendar can be found here or in the menu on the left-hand side of our website. “My name is Molly Dunton and I live and work in DC, not far from FERC headquarters. I have the pleasure of working for the national environmental non-profit Earthworks, and I have the privilege of working with residents around the country that have been negatively impacted by extreme energy development. In other words, my job involves supporting communities that have been forsaken by FERC in the name of corporate profits. I may not live in a frontline or fenceline community, but I carry the voices of my partners on the the front lines with me into my work. My home is not currently threatened by one of FERC’s reckless project approvals, but when might it be? Regardless of how much or how little physical stake any of us has in a given project on FERC’s docket, this fight is personal.” Click here to read more from Molly on the January 2018 disruption of FERC’s Commission Meeting. FERC doesn’t work – and it’s about to get worse. Trump’s pro-industry commissioners are ready to use their new rubber stamps to approve more fracked-gas pipelines while Congress pushes legislation to expand FERC’s authority. PLEASE head for FERC on Sept. 20 at 8:30 a.m. The change starts here. Click here for more details. Three people were arrested as they interrupted Senate committee hearings for the last two Trump nominees to serve on the Federal Energy Regulatory Commission. One of them, Andrew Hinz (top), who worked at FERC for 25 years, called out: “Have a conscience! FERC is destroying the atmosphere!” Read all about it at our blog post. Three people representing a coalition of nearly 170 groups were arrested disrupting a committee vote to advance the president’s nominees to the Federal Energy Regulatory Commission. They stood up and spoke out about FERC’s abusive practices and disregard for the environment. Read all about it at our blog post. BXE protesters disrupted hearings for President Trump’s nominees to the Federal Energy Regulatory Commission, calling out “FERC hurts families, Shut FERC down!” and “FERC hurts families, FERC hurt towns” and “The future is watching.” Four were arrested and one detained. Read all about it and view photos and videos here. There is no such thing as a good FERC commissioner. Until Congress takes steps to replace the agency with one dedicated to a just transition off of fossil fuels, the Senate should oppose all nominations. It’s especially important to block appointments to FERC now because the agency is operating below quorum and any delays in the confirmation process is a delay to all of the harmful fracked gas infrastructure projects that are awaiting FERC’s rubber stamp. Read on here. Call on Congress to stop or delay Trump’s nominations to FERC and push for what we really need: an agency dedicated to a just transition from fossil fuels. We’re asking communities across the nation to call key senators on March 22 & 23 and then again on April 5 & 6. Read all about it at our blog post. Please join us as we seek to pack the Thursday, Jan. 19, meeting in DC of the Federal Energy Regulatory Commission, the agency that ruins communities and our climate by rubber stamping fracked-gas infrastructure and much more. Facebook event page here. Also planned are speak-outs from people in front-line communities from 10 -10:30 a.m. and a rally from 10:30 – 11 30 a.m. Email us at Actions@BeyondExtremeEnergy.org for more information. BXE stands in solidarity with the Standing Rock Sioux and other indigenous leaders in their efforts to stop the North Dakota Access Pipeline. 4. Lots more information here. On Dec. 1, more than a hundred #NoDAPL actions across the world are kicking off a Global Month of #NoDAPL solidarity to #ProtectWater in the face of escalating human rights abuses. Join this Thunderclap by noon Dec. 1 to amplify our voices. The financial footing of the Dakota Access Pipeline is in jeopardy if Energy Transfers does not complete the project by Jan. 1. If this deadline is missed, a majority of the shippers with contracts to use the pipeline will be able to renegotiate or cancel their contracts. Read more here. DNB Bank of Norway, one of the major financiers, has already sold its assets in the company due to public pressure and is considering withdrawing its loans. Indigenous leaders are asking people to keep up the pressure on the investors of Dakota Access Pipeline and the Sheriff Departments that have been brutalizing peaceful water protectors. Straw bales needed: The Standing Rock camps are having problems getting straw bales for construction and insulation. North Dakota and South Dakota sources are drying up and refusing to sell or deliver to Standing Rock. Please spread the word that straw bales are needed; transportation can be worked out. With the first significant snow expected this week, firewood and winterizing will be needed. Please share and refer folks so we can make sure #protectors and families are cared for during the harsh winter ahead. Beyond Extreme Energy supports the Standing Rock Sioux’s stand against the 1,134-mile Dakota Access Pipeline. Read about the protectors on our blog post and about a New Haven, CT, solidarity protest here. Read all about BXE’s solidarity action at TD bank branches in DC here. BXE has created a Frontline Community Support Fund. Read all about it in our blog post. BXE activists blockade the entrance to the Democratic National Committee offices. Read all about it in our blog post. Beyond Extreme Energy extreme? Not at all. Read all about it at our blog post. BXE activists interrupted U.S. Energy Secretary Ernest Moniz to carry the message of “No LNG Exports” to the Virginia Energy Forum. Read all about it at our blog post. The #RubberStampRebellion has been at FERC (and much more) this week. Read blog posts from Day 1, Day 2 and Day 3 and Day 4. The schedule is here. 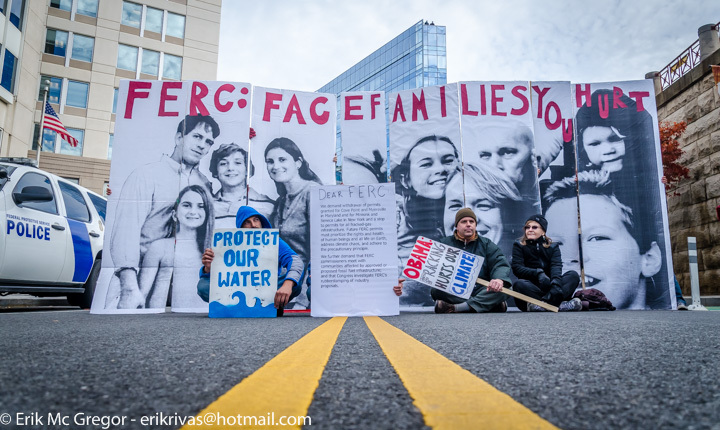 People of faith told FERC commissioners at their April meeting that permits for fracked-gas pipelines and other infrastructure are harming all life and morally wrong. Read about it and watch videos at our blog post here. Dozens of Democracy Spring activists show up for BXE’s Dunkin’ Democracy event at the Federal Energy Regulatory Commission. See more photos and read about our action on the BXE blog here. Michael Bagdes-Canning writes about wealthy companies’ seizure of private lands in Pennsylvania for fracked-gas pipelines. “It may be legal, but it is not right. The courts may sanction it, but there is no justice,” he says. Read his blog post here. On the sidewalk in front of FERC, Beyond Extreme Energy and other activists talk about that agency’s destructive permits. They implored FERC commissioners to join them for pancakes cooked on a solar stove and topped with the last syrup from Megan Holleran’s maple trees, which were cut down for a pipeline. Filmmaker Josh Fox, Holleran and five others were arrested in the #PancakesNotPipeline action. Read all about it at the BXE blog. (Photo via Twitter by Eleanor Goldfield at Art Killing Apathy.) Also, be sure to view Josh Fox’s short film about the Holleran family, their maple trees, climate change and the #PancakesNotPipelines action at FERC. Led by Nancy Vann, a Peekskill landowner whose property was taken by Spectra for pipeline construction, several New York residents stood up at FERC’s March public meeting to ask the commissioners why they have ignored Gov. Andrew Cuomo’s urgent request to halt construction on Spectra Energy’s Algonquin Incremental Market (AIM) project. Protesters, including Cari Gardner (above), were forcibly removed from the room. Read the full report at the BXE blog here. BXE hails FERC’s rejection of the Jordan Cove LNG facility and related pipeline in Oregon. It is one of many projects BXE has targeted during actions at FERC. During BXE’s 18-day water-only fast at FERC last fall, Francis Eatherington, above, was roughly led out of a FERC meeting while trying to explain her concerns about the project. Read BXE’s and Eatherington’s reaction at our blog here. Dozens from around the county rallied in March against Dominion’s planned fracked-gas liquefaction and export facility at Cove Point. Read about Cove Point Spring Break here. Protests are mounting against Duke Energy’s plans to “modernize” with yet another generation of fossil-fuel powered plants. Read Steve Norris’ BXE blog post here. Several BXE activists have been in northeastern Pennsylvania to stand with a family and community trying to stop the clearing of maple trees for the 124-mile long Constitution Pipeline. Tree-chopping has begun. Read blog posts by Ted Glick of BXE here and here. ResistAIM defenders block work on Spectra’s fracked-gas pipeline under the Hudson River. Read all about it at the BXE blog here. In a carefully coordinated, rolling cross-country action, Beyond Extreme Energy (BXE) and Stop the West Roxbury Lateral pipeline (SWRL) delivered humorous but pointed Valentine’s Day cards (such as above) to the four FERC commissioners at their homes and DC residences. A press release is here. Press coverage here and here. To send a belated card, grab your paste, markers, fancy doily hearts and construction paper (or print out our #valentine) and get all the details here. Charges have been dropped against these BXE climate activists, who called out Exxon for the company’s #ClimateCrimes. Read more at the BXE blog. Check the BXE blog for more. View FERC’s official calendar here.